CATHERINE Dolan’s early second half goal proved decisive in their semi-final victory over Waterford at St Brendan’s Park Birr on Sunday as Cavan booked their place in back-to-back Division Two finals. The Breffni County, who lost out on the Division Two title and promotion after a replay to Westmeath last year, charged out of the blocks to lead 0-4 to 0-0 after eight minutes. Playing with the strong wind, Aisling Doonan got James Daly’s side up and running in the first minute with Bronagh Sheridan adding a brace and Doonan finding her range again to put some early pressure on their opponents, who were struggling to convert their chances at the other end. They did eventually get on the scoreboard in the 19th minute through Maria Delahunty but that point was quickly cancelled out by Doonan who put the Cavan lead back to four, 0-5 to 0-1. Waterford did hit the last two scores of the first half, a Delahunty free and a Lauren McGregor point, to reduce the deficit back to 0-5 to 0-3 at the break and indeed, they could have taken the lead going in but for Cavan goalkeeper Evelyn Baugh producing a fine double save to first deny Geraldine Power and then Eimear Fennell. The gap was back to one immediately after the restart through Fennell but Cavan responded through their captain Sinead Greene to make it 0-6 to 0-4 before Dolan grabbed that vital goal in the 33rd minute, managing to hold off a number of the Waterford defence before firing home past Grainne Kenneally. That put Cavan five points up and although Waterford replied with three of their own through three Delahunty frees, they could not get any closer than two points. A Doonan free and a point from play from Bronagh Sheridan stretched the Cavan lead back to four and although that was their last score with still 10 minutes to play, Waterford managed just one further point through Liz Devine as the Cavan defence stood firm to set up a final meeting with Tipperary on Sunday, May 6 in Parnell Park. For manager James Daly this was the performance he was looking for from his charges, especially after suffering a 12 point defeat when the sides met earlier in the league. “It was a great game and a great performance. We played with a strong wind in the first half and I would have liked at least a five point lead at half-time but we got sloppy towards the end of the half and they got a couple of scores,” said Daly. “We spoke at half-time about needing to carry the ball and play football with that wind and we have some great ball carriers and experienced players and that is what we did. I thought we were deserved winners and played the better football throughout. Defensively we were very solid and I am really happy and looking forward to the final. 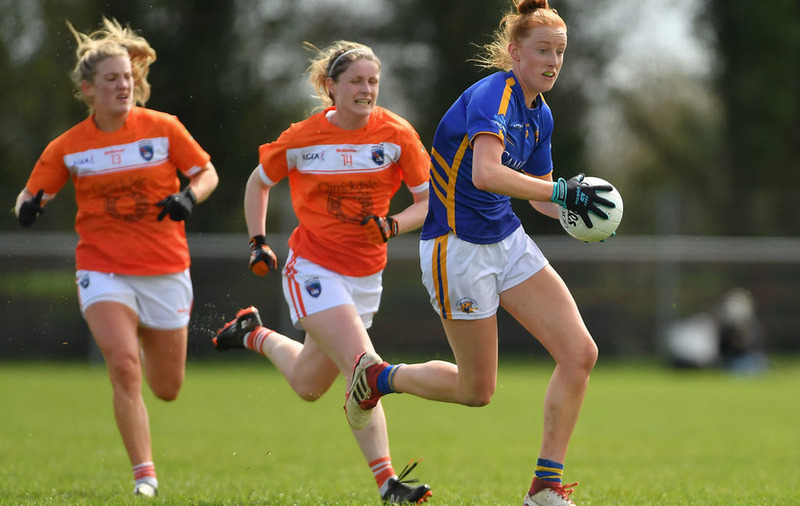 ARMAGH let slip a nine point lead as Tipperary produced a stunning comeback at Coralstown/Kinnegad on Sunday to seal their place in the Division Two league final next month. The Orchard County were 4-3 to 1-3 ahead within seconds of the second half restart when Blaithin Mackin found the back of the net in a move worked from the throw-in and despite playing against a strong wind, it looked like the three goal cushion would be enough, knowing too that they could add to it. However, in similar vein to their earlier league meeting, back in the first round, Tipperary were not to be outdone. That day they came back from seven points down early in the second half and this turnaround was as equally as impressive. Armagh got off to a poor start and found themselves 1-1 to no score down after just four minutes, Mairead Morrissey with the goal after two minutes and Orla O’Dwyer following up with a point. However, Armagh woke up and within 10 minutes they were in front. Lorraine McCaffrey and Fionnuala McAtamney’s side were in front for the first time 1-3 to 1-1. Tipperary levelled matters through O’Dwyer and Aishling Moloney before a strong finish to the half saw Armagh lead by six at the break, 3-3 to 1-3 with Mackin and Lauren McConville finding the back of the net. It looked good for Armagh when the younger of the Mackin sisters Blaithin goaled from the restart but Tipperary’s purple patch yielded 1-5 without reply and all of a sudden just one point separated the sides with still a quarter of the game to play. Moloney got the comeback rolling with a point from a free in the 36th minute, adding two more points from play after O’Dwyer also added one to make it 4-3 to 1-7 by the 42nd minute. And two minutes later it was very much game on as Tipperary pounced on an Armagh mistake from the kick-out and Gillian O’Brien was on hand fire home and another Morrissey point left the minimum between them, 4-3 to 2-8. Caroline O’Hanlon, who did not start, was introduced early in the second half and her two points in the 50th and 51st minutes looked crucial as she put three between them. However, Roisin Howard’s goal a minute later had the sides level for a second time. 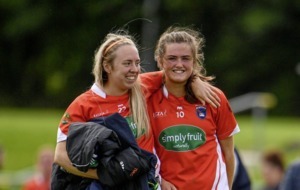 McCoy edged Armagh back in front with two minutes remaining but Maloney levelled matters again before Kate Davey stepped up with the winner to break Armagh hearts. Joint manager Lorraine McCaffrey said that despite the frustration and disappointment, they will learn from this and turn their focus to the championship. “It is a five minute period that will haunt us. We were the best team on the day but playing against a very strong wind in the second half we struggled to win our own kick-outs and get our hands on the ball,” she said. “Collectively we all take responsibility and we are very disappointed. But credit to Tipperary, they saw the game out. We were unlucky not be be further ahead at the half-time and for those five minutes in the second half we switched off. That cost us a few games during the league and it cost us again, but this is something that we can address and turn around. It is not insurmountable. We played some fantastic football but switching off cost us. We now have seven weeks before the championship to prepare and that is our focus now. 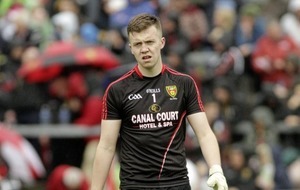 DOWN’S hopes of a Division Three final appearance came to an abrupt end at Inniskeen on Sunday as Meath proved much too strong for the Mourne County. The one-sided scoreline is somewhat unfair to Ryan McShane’s charges in that despite being well beaten, they fought the whole way to the end and had only Jess Foy’s three points to reflect that on the scoreboard. Meath played with the wind advantage in the first half and were well in control at half-time leading 3-11 to 0-1. Niamh O’Sullivan’s early goal set the Royal County on their way early on and when Foy opened Down’s account on the quarter hour mark, they trailed 1-6 to 0-1 with Aoibhin Cleary and O’Sullivan adding further majors. Foy added Down’s second point in the 36th minute as the sides exchanged the first couple of scores after the resumption but then Cleary grabbed her second and Meath’s four goal of the game in the 40th minute to make it 4-13 to 0-2 and substitutes Emma White and Marion Farrelly also grabbed a goal each either side of Foy and Down’s third point in the 50th minute as the scoreboard read 6-15 to 0-3 with another couple of Meath points added on in the final minutes. While defeat in this manner will undoubtedly hurt for the Mourne Ladies, they can take a lot from this very successful league campaign. They won just one game last season in the league and held on to stay in Division Three. This season, they made the top four defeating the likes of Kildare, Roscommon and Offaly on the way. 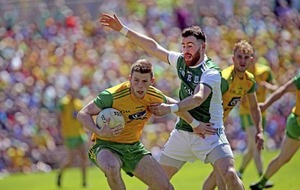 They must now turn their focus to the Ulster championship where Tyrone and Fermanagh await. The Division Three final will be contested between Meath and Wexford, who defeated Kildare in Sunday’s other semi-final 2-14 to 0-11. ANTRIM found themselves on the receiving end of a Wicklow annihilation in Sunday’s Division Four league semi-final at Inniskeen. The Saffrons made the ideal start and were 0-3 to 0-0 ahead early on with points from Cathy Carey either side of one from late replacement to the starting line-up Aoife Taggart. However, 2-2 from corner forward Laura Hogan had Antrim rocked and from there Wicklow never looked back, the goals coming in quick succession as Antrim were hit for two in the space of 60 seconds. Her first saw Wicklow exploit the gaps in the Antrim defence for Hogan to fire home past Anna McCann to put her side into a 1-2 to 0-3 lead and then immediately from the resulting kick-out, Wicklow overturned possession and Hogan fired once again to the back of the net. Carey kept Antrim in touch with another point after Marie Kealy had hit Wicklow’s third point, before the Leinster side grabbed a third goal, this time through substitute Meadhbh Deeney on 22 minutes and the latter dusted herself down after being fouled by Emily Faloon, who was subsequently sent to the sin bin, to despatch the ball home from the penalty spot and give her side a 4-5 to 0-5 lead. Wicklow, who finished top of Division Four unbeaten, continued their dominance after the resumption with Clodagh Fox grabbing a fifth goal. 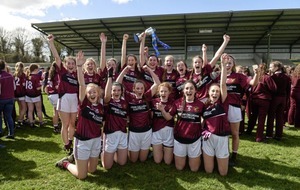 A Carey free made it 5-6 to 0-6 but Wicklow tagged on further points through Denney, Fox and Hogan and Lorna Fusciardi added a sixth goal, 6-10 to 0-6 and Hogan completed her hat-trick right on the full-time whistle to wrap up a convincing win for the league title and promotion favourites. Wicklow will now meet Louth, who defeated Limerick 1-15 to 0-9 in the other semi, in the Division Four final on Monday, May 7. DUBLIN and Mayo will contest the Lidl National Football League Division One final with a new name destined for the cup for the first time since 2012. Mayo knocked out defending champions Cork in Birr on Sunday winning by two points, 1-20 to 3-12, and ending Cork’s bid for six in-a-row while Dublin needed a last gasp Nicole Owens goal to defeat Galway 2-8 to 2-7 at Coralstown/Kinnegad on Sunday also. Dublin never led until that Owens winner and a place in their first Division One final, a real blow for Galway who had dominated. They led 2-5 to 1-4 at the break, Leanne Coen finding the back of the net inside the first minute but Dublin equalised through Niamh McEvoy on 20 minutes. Playing with wind in the first half, Galway added to their total with a second goal through Mairead Seoighe to make it 2-3 to 1-3. The Connacht side led 2-7 to 1-5 on 38 minutes, but after that they failed to score while Dublin kept going with Niamh McEvoy, Noelle Healy and Aherne reducing the gap entering stoppage time. Then Owens fired home the winner and although Galway did have a chance to send the game to extra-time with a free, it was pulled wide. In the other semi-final, Mayo’s Sinead Cafferky scored a vital second half goal in a high scoring encounter. They led by one at half-time, 0-14 to 2-7, after Cork had been in front earlier in the game, 1-4 to 0-2 after seven minutes, Orla Finn with the goal. They also missed a penalty, which was saved by Sorcha Murphy, denying Eimear Scally. Mayo had a wake up call and rallied, dominating the rest of the half with point from Niamh Kelly, Sarah Rowe and Grace Kelly and Mayo led 0-14 to 1-6. But Cork were thrown a lifeline when Finn got their second goal and just before half-time she pointed to make it 2-7 to 0-14 at the break in favour of Mayo. Four minutes into the second-half, Cork were back in front, when Coppinger hit Cork’s third goal, to make it 3-8 to 0-15. The lead ebbed and flowed between the sides before Cafferky’s vital 51st minute goal making it 1-19 to 3-9 and despite some late points from Cork, Mayo hung on.